Fashion World offer a huge selection of clothing and other products for all genders, ages and sizes. Whilst their main focus is on women's fashion they offer an extensive range of products for the family and the home. They offer FREE delivery on orders over £40 to any myHermes ParcelShop. You can find your nearest ParcelShop here. Great value Bundles for men, women and your home. Affordable fashion in sizes 12 to 32. Inspiration and options that means you can make more of your wardrobe whenever you want. Simply Be is for women who believe that style doesn't have to be based upon the size of a dress. Their intention is to provide inspiration to women who just want to be themselves. They pride themselves on offering fashion without compromise. Fashion delivered 7 days a week. Order online by noon on Saturday and your new Simply Be outfit can be delivered to your door on Sunday (Monday to Friday next day deliveries available on all orders placed before 10pm). Alternatively, if you are spending more than £40 then you can opt to have your items delivered to one of over 5,000 myHermes ParcelShops across the UK (many of which are open late and at weekends for extra convenience). With famous clothing brands such as AX Paris Curve, Coast and Grazia, lingerie by Ann Summers and Gossard and accessories by Michael Kors, you will always be at the height of the latest fashion trends. For those who just want to be themselves shop at Simply Be. Simply Be has all the latest high-street styles and fashions in sizes 14 to 32 (all sizes one price). Look online and see their new season range. La Redoute brings French style to the UK with their extensive range of clothes that aim to fit and flatter. Their prices are great too providing you with French style for less. Why not TRY BEFORE YOU BUY with a "Style Credit Account". Their credit account lets you shop without having to pay anything until 21 days after your statement is generated. With FREE RETURNS this is a convenient way to find the right outfit before you have to pay for it. It also comes with early access to the 70% OFF SALE and special VIP DISCOUNT CODES. Note: If you choose to pay the full balance you will not be charged interest. If you choose to pay anything less than the full balance then you will be charged interest making the overall cost of the products more expensive. The La Redoute catalogue offers an extensive collection of womens fashion from exclusive ranges by celebrated international designers to great value plain white T-shirts. 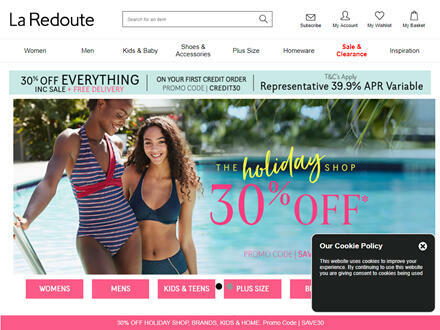 Mums also love La Redoute's adorable baby wear and childrenswear. Argos Catalogue has a massive range of products for the home. From small electricals to widescreen TVs, indoor and outdoor furniture and toys. Whatever you are looking for can probably be found at Argos. 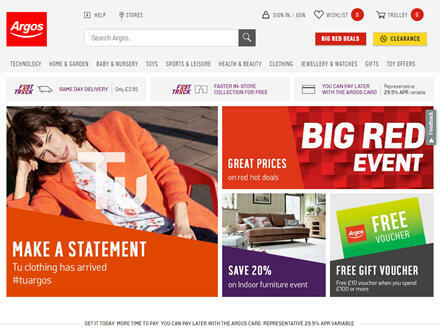 Now part of the Sainsburys group they are now even offering clothes on their website. Buy Online today by 6PM and Argos will deliver by 10PM. Bargain Crazy sell surplus stock from the Shop Direct Group who have brands like Very and Littlewoods. At Bargain Crazy it is all about selling big brands at rock bottom prices. 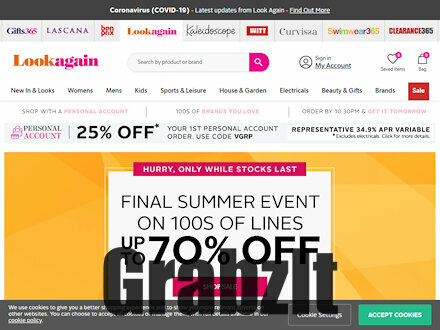 It is a place where the UK's favourite brands can be found at up to 80% discount on the original catalogue price. On our site you will find everything from ladies fashion to menswear, childrenswear, homeware and electrical, all at clearance prices. Bargain Crazy offer 100% genuine products from big name brands such as Nike, Superdry, Lipsy and Adidas plus a range of new and refurbished electrical items with a 12 month guarantee. 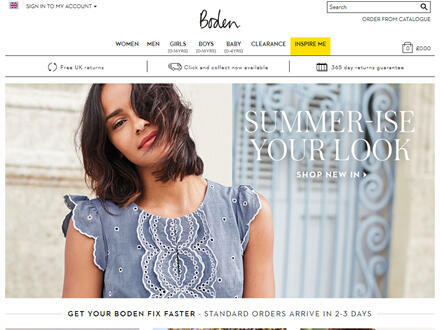 Boden are British fashion at its best. The quality of their clothes are unmatched and the service they provide is fabulous. They sell exclusive prints in the best quality premium fabrics for men, women and children, so if you are looking for hardwearing but fashionable clothes for all of the family then Boden is for you. They offer FREE & EASY RETURNS with a no quibble guarantee. You can return an item within 3 months of receipt and receive either a refund or an exchange. You also have a whole year to return any item that you are not happy with. For your convenience there is also a CLICK AND COLLECT service to over 7,000 locations across the UK. From local stores to railway stations and all branches of Halfords and Doddle there is sure to be a pick up point close to you. Once your parcel has been delivered to your selected collection location you have 10 days to collect it before it is returned automatically to Boden. Boden do a pretty good job of making beautiful, colourful clothes for all the family. There are also great pieces for babies, kids and teens in Mini Boden and johnnieb. 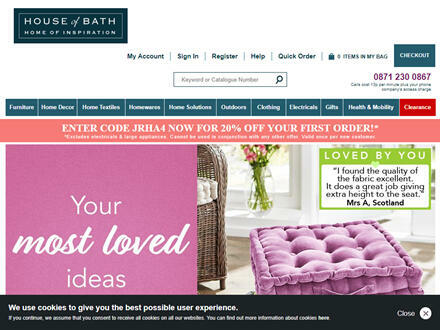 House Of Bath is the leading homewares catalogue brand in the UK. They provide stylish, unique and 'hard to find' products and solutions for the home. All of their products are stylish and inspiring plus excellent value for money. With superb customer service and fastand convenient home delivery, shopping for your home at the House Of Bath is always a pleasure. 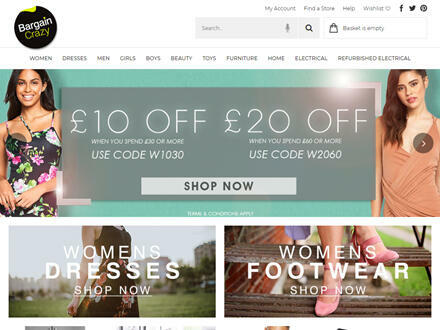 bonprix sell womens, mens and childrens clothing that you will not find on the High Street. Unique fashion at amazingly affordable prices that follow the very latest trends. For women sizes range from 6 to 32 and include lingerie and maternity collections. For those looking for CREDIT they also offer their "Personal Account". This allows you to purchase the latest looks without paying a single penny upfront. You can take up to 14 days to decide whether the outfit is for you. Plus, once it comes to paying your monthly statement, you have the freedom to decide whether to PAY IN FULL or SPREAD THE COST. Note: If you pay your monthly statement in full then you will not be charged interest. However if you decide to spread the cost then bonprix will add interest to your "Personal Account" and so your outfit will cost you more than the original price of the items. bonprix catalogue has over 13,000 products including lingerie, womenswear, menswear and kidswear at unbeatable prices. 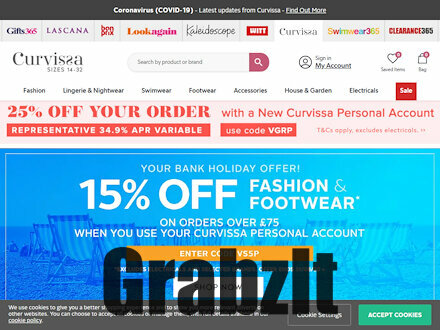 Curvissa has one of the largest online catalogues for plus size clothing, with over 3,000 quality fashion items in sizes from 14 to 32. 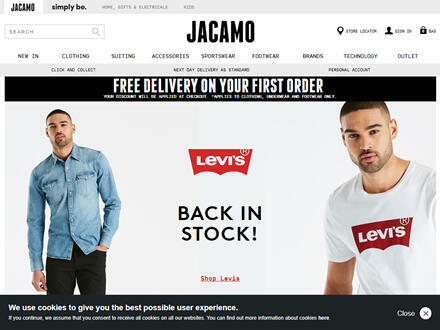 Jacamo is the one stop shop for Menswear, providing the modern man with an effortless shopping experience. If you are a man that likes to look good in Branded Clothing but hates fighting with the crowds in town then Jacamo is perfect for you. Next Day Delivery comes as STANDARD so there is no need to stress about when to get that outfit for next weekend. Alternatively, if you know you are not going to be in to receive a delivery you can order by Click and Collect, where your items can be collected from store at your own convenience. JD Williams provide stylish and fashionable Plus Size clothes for women looking for contemporary outfits that flatter when worn. Sizes range from 12 to 32. Each garment has been tried and tested to make sure you look good whatever your age and shape. You can be confident in the quality and fit of the clothes they have to offer. With a wide range of lingerie sizes and wide fitting shoes and boots, you need to look no further to complete that overall look. John Lewis is the epitome of Quality and Service. The complete Department Store offers 1000s of products from clothes to electricals, homewares to beauty products. 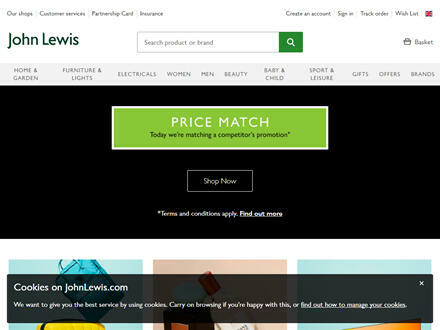 Whatever you are looking for at John Lewis you can guarantee that it will be of the highest quality backed by a unique level of service. Rather than offering a credit account, they offer their Partnership Card. This is essentially a credit card with benefits. Every time you spend on a John Lewis Partnership Card you earn points that can be converted into shopping vouchers. Every 500 points is worth £5 in vouchers that can be redeemed in store. You can earn 1 point per £1 spent in store, online or at Waitrose supermarkets and 1 point for every £2 spent on the card elsewhere. Note: Like any other credit card, if the balance is not cleared each month then you will be charged interest meaning the cost of any purchases will be higher than what you originally paid for them. Looking for a catalogue that can provide you with everything your family needs for themselves and your home, then Look Again is the place to shop. With year-round clothing and footwear to build a fashionable wardrobe for each member of the family and quality homewares to create that stylish home, look no further than Look Again. Deliveries are available 7 days a week with the option of Next Day Delivery too. To help with the family finances Look Again offers a range of payment options so you can spread the cost with a Personal Account. When your statement arrives, you can then choose to pay anything from the minimum payment amount up to the entire balance. Note: In any month, if the full balance is not paid by the due date on the statement then interest will be added to the balance on the next statement. Any interest added to your account will mean that you are paying more for the good than their original price. Look Again is packed with fashionable clothes and homeware items. Aiming to keep up to date with the latest trends, they add hundreds of items to their online catalogue each week, evern better new items are offered at 20% off for 7 days. 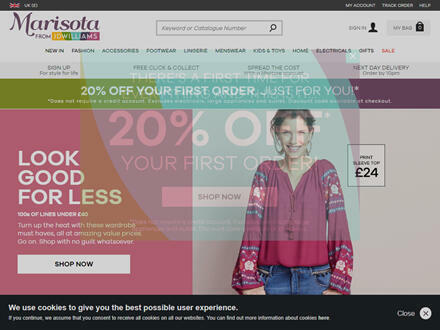 Marisota are famous for selling womens clothing that has been designed with shape in mind. Their SHAPEology initiative delivers quality fashion that provides confidence whatever the shape or size of your body. Sizes range from 12 to 32 with selected items 10 to 36. There are convenient delivery options such as Next Day (order by 10pm), Nominated Day and Click and Collect. Their website also contains a blog called marisocial where you can browse the trends before getting the look. 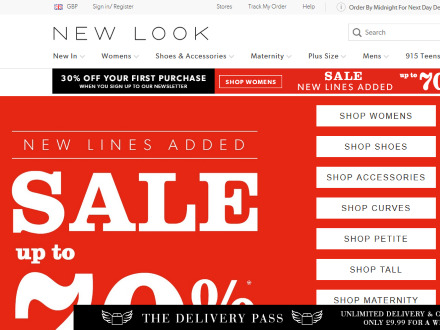 New Look sells must have fashion for Women, Men and Teens. With the emphasis on looking young, New Look delivers the latest styles and trends to those that want to look good. Delivery is 7 days a week both daytime and evenings. Returns are FREE to New Look stores, Collect+ and Doddle. Students can also get 10% OFF via UNIDAYS. 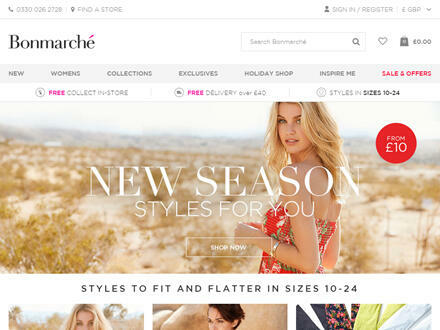 New Look is the favourite value-fashion brand in the UK. Their online catalogue contains the latest trends and hottest celebrity looks, regardless of age and size. Next is the ultimate retailer for providing fashion and style for you and your home. Cutting edge trends in the most up to date prints and colours, pretty much defines what Next has to offer. Their delivery service is unrivalled too. Order before Midnight for NEXT DAY delivery to either your home or a store. Whilst it is possible to pay for goods via credit or debit card, the Next Directory is a catalogue credit account. Goods purchased are charged to your Next Account and a statement is generated each month. Like all credit accounts you have the choice of paying down your complete balance in full or anything over and above the minimum payment. Note: If you pay your balance in full you will not be charged interest. Anything less than the full amount then interest will be added to the account. If you elect to have interest added then your items will cost more than the price you paid for them. Premier Man specialise in clothing the more mature man, where comfort and fit is a high priority. The self-styled Size and Fit Experts, provide shirts with collars ranging from 14 to 22 inches, chest sizes from 36 to 66 inches, waist sizes from 32 to 64 inches and shoes sizes from 6 to 16. They offer NEXT DAY delivery and have an easy returns policy. The Premier Man catalogue has a range of smart clothing for larger men. Waist size options range from 32 to 64 inch and chest sizes from 36 to 66 inch. Verbaudet has been clothing children in France for over 40 years. Quality and stylish childrenswear that you will not be able to find anywhere else. They pride themselves on their affordability whereby the price of an item is the same whether the child is 2 or 14 years of age. 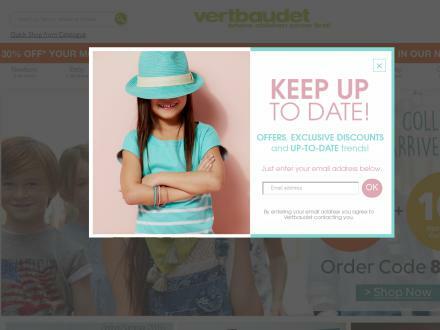 The Vertbaudet Catalogue specialises in unique childrenswear that cannot be found on the High Street and provides the latest high quality styles for mums-to-be, babies and children aged up to 12 years. What are online catalogues offering in April 2019? April is Easter holiday time and with Easter Sunday being a little later this year on the 16th, the online catalogues have lots of deals to make the most of the Spring weather. 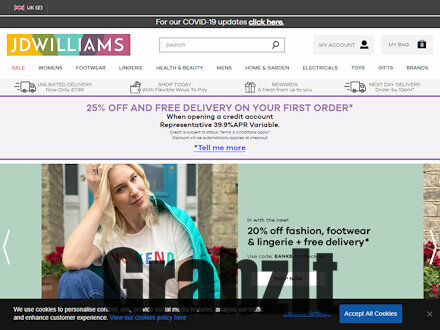 Try JD Williams for great deals on Outdoor Furniture or Fashion World to add to your new season wardrobe. If you are feeling fit the London Marathon is on the 23rd April in 2019 and even if you are not running the catalogues are all offering great prices on their Sportwear ranges. Try Simply Be for a great range of Branded Sportwear including Adidas, Nike and Pineapple. Another date for the diary this month is the 29th sees the start of the Tour de Yorkshire, so if you are a keen cyclist look out for lots of cycling based offers this month. Which are best for Plus Size Clothes? See below for the most popular brands in the UK currently selling plus size clothing. Julipa - Womenswear in sizes 10 &dash; 36. Menswear in chest sizes 32 &dash; 64. Marisota - Womenswear in sizes 12 &dash; 32. Footwear widths up to EEEEE. Simply Be - Womenswear in sizes 12 &dash; 32. Bras G+. Historically in the UK, mail order catalogues were traditionally large glossy printed books containing products available to purchase from home. Typically customers would browse through a catalogue and make a list of items they would like to purchase. Orders would be placed by either completing an order form then posting it to the retailer (hence 'mail order') or latterly by phoning a call centre. However, the last 20 years has seen major improvements in supply chain and logistics and along with the introduction of high speed internet, the concept of home shopping has undergone a major transformation. 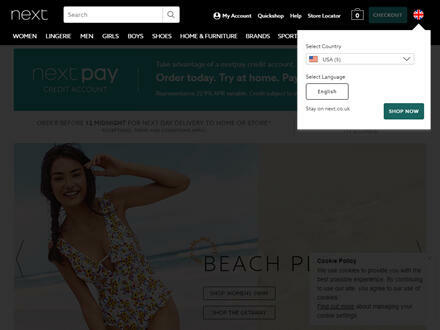 Today all of the major retailers have their products online, accessible via websites or apps. This has meant that the retailers can react much more quickly to demand than they could previously. The traditional mail order catalogue would be produced twice a year, one for the Spring / Summer seasons and another for the Autumn / Winter seasons. This would mean that customers would see a fixed set of products at a fixed set of prices. To introduce new products or amend prices, retailers would have to produce supplementary smaller brochures and these would be posted to customers throughout the year. However, now with the introduction of online shopping, product and price changes can be carried out at any time, allowing retailers to react much more quickly to changing market conditions. Does this spell the end for the old-style mail order catalogue? Not yet. Whilst most home shopping retailers have stopped automatically mailing their customers a copy of the latest catalogue, a lot of them will still send them out on request. Many also still have a programme of producing brochures to showcase new products or special offers. This serves the purpose of reminding customers that the retailer still exists. Customers can find new marketing methods such as email or text messaging to be annoying, meaning they are easily discarded, whereas tangible items like catalogues and brochures are treated more like magazines to be browsed during leisure time. Who knows what the next innovation will be to transform home shopping but for the moment in the UK, catalogues are not dead yet. BritishCatalogues have a fine tradition of providing the best first order discounts from the top UK home shopping catalogue brands. There are plenty of great offers available and in times when value for money becomes more and more important, make the most of these fantastic savings by clicking on the catalogue brand you like the most.